The German documentary "The Wonderful, Horrible Life of Leni Riefenstahl" (now playing at New York's Film Forum) is a profoundly unsettling three hours at the movies. 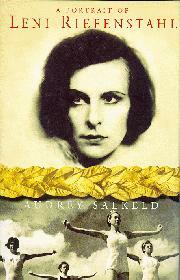 At the beginning, a voice-over narration tells us that the movie intends to examine Riefenstahl's unique career "without preconception" -- not an easy task, because her work has always been clouded by her reputation as "Hitler's favorite filmmaker." Riefenstahl, whom Pauline Kael once called "one of the dozen or so creative geniuses who have ever worked in the film medium," directed two undeniably brilliant movies, both of them tainted by the circumstances of their making: "Triumph of the Will" (1935), which records the 1934 Nazi Party Congress at Nuremberg, was commissioned by Hitler himself; "Olympia" (1938), a two-part documentary about the 1936 Olympics in Berlin, was officially commissioned by the International Olympic Committee but was largely -- and lavishly -- funded by the Third Reich's treasury. The filmmaker has always insisted that her movies were never meant to advance the political program of National Socialism -- that she looked at the world with the pure, disinterested eye of an artist, and cared only about the noble task of giving vivid cinematic form to contemporary events. She's now ninety- one years old, and in full command of her faculties. And in "The Wonderful, Horrible Life" she holds up impressively under the on- camera interrogation of the film's director, Ray Muller; she sticks to her story. If you believe her, she's one kind of monster; if you don't, she's another. Her version of her career makes her a tragic figure, an artist seduced into the service of evil by her blind, obsessive dedication to aesthetic principles. She was a victim, she maintains, of her naivete and misplaced idealism, and has paid a heavy price for her errors: she hasn't made a film since the end of the war. She asserts that when she first met Hitler, in the early thirties, she had never heard of him. She thought his anti-Semitic rhetoric was just "electioneering" -- nothing serious. For her, "Triumph of the Will" was about "peace" and "creating jobs," and to support that dubious interpretation she points out that Hitler's speeches in the film make no reference to his racial ideology, it doesn't occur to her that this omission undermines her claim to be a scrupulous recorder of history. At one point in "The Wonderful, Horrible Life," she tearfully evokes her disillusionment at the end of the war, when she confronted the evidence of the Holocaust; her "ideals," she says, were "shattered." It's difficult to feel much sympathy for someone whose "ideals" were flexible enough to have remained undisturbed by the virulent racism of Hitler's oratory, or by the invasions of Poland and Czechoslovakia, or by the Reich's instigation, for nakedly imperial purposes, of a war that devastated Europe, or by the mysterious, total disappearance of the Jews from German life. In Primo Levi's final book, "The Drowned and the Saved," there's a section in which the author reprints letters he received from Germans after the publication in that country of his "Survival in Auschwitz" and discusses his replies to them. The only letter that made him truly angry, he writes, was from a couple who tried to argue that Hitler's anti- Semitism was "never popular" among Germans, and that his followers had been innocently duped by his "beautiful words." Levi doesn't let them get away with this transparent, self-serving fiction: "There's neither a page nor a speech of Hitler's in which hatred against the Jews is not reiterated to the point of obsession. It was not marginal to Nazism: it was its ideological center." Levi's succinct, furious reply to these revisionist correspondents might also serve as a response to Leni Riefenstahl's grotesque apologia for her life as a Nazi artist. Her beautiful images matched her leader's "beautiful words" with uncanny precision. And, as this strange, fascinating documentary reveals, the carefully composed story that she tells the world about herself has the same sort of worthless, destructive beauty -- the inhuman perfection that the ideal shares with the merely unreal.